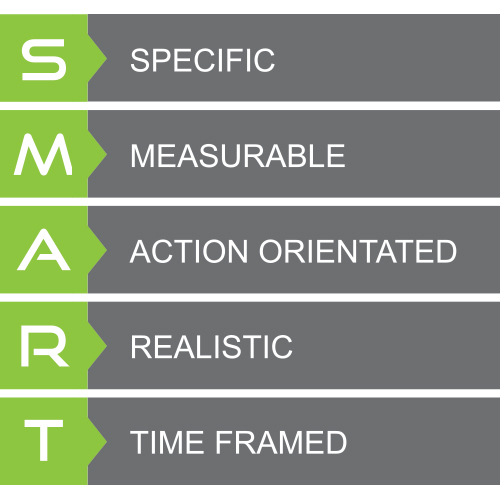 Making Changes Happen This Year with SMART Goal Setting – Why and How? As the suntan fades and the holiday period becomes a distant memory, you might recall thinking at some point about what you were going to achieve this year. Get fit, lose weight, drink less alcohol, improve your diet, earn more, get more balance with your work/lifestyle, perform better at work, improve your relationships, find a partner or learn a new skill or language … inevitably, for most people, there is something they want to change in their lives, which is great because change is good! To quote Dale Carnegie: “if you are not getting better you are effectively getting worse”. So why is it that the desire for change and the actual actions and behaviours don’t always align? What gets in the way? Your motivators play an important role, which are often linked to your core beliefs. Understanding what your underlying need for change is at an emotional level along with your sense of purpose will help you set the right goals. Setting effective goals is a way of ensuring you focus on the right things, take action within a defined time frame and ultimately reach the outcomes you desire. People who set goals are more likely to bring about changes in their lives than those who don’t. A coach can help you identify your motivators, work with you on your emotional connection, assist with setting the right goals, keep you focussed on the actions needed and support you as an accountability partner. Goals need to be SMART or SMARTER. This means they must be Specific, Measurable, Action orientated, Realistic and Time Framed. For business goals, they also need to consider the Economic impact and Return on the investment of time or money. A goal should be written down and always starts with “I will …”. This means you own it and are responsible for executing it! Specific means a clearly identified objective and keeping it simple beats complex every time. A Measure of success is critical in knowing how to determine when you have succeeded and allows management. This also helps to monitor progress and celebrate short-term wins along the way to maintain motivation. A reality check as to where you are at currently with achieving the goal gives a place to start from and explores how Realistic the Time frames are. Actions are imperative. Make a detailed list of all the actions to ensure you have actually thought about what you are going to do. Timeframes increase the urgency and likelihood of the goal being reached. Consider also how the goal will impact you and/or your business Economically and how the use of time and resources will provide an acceptable Return on investment. Now you are ready to write a SMART goal. Here is an example. I will set 1 × personal goal and 1 × professional goal for each ¼ of 2016 and complete each of these within 90 days. Managerial leadership – Is it easy or harder than riding a horse? Greg Bartlett has been our business mentor for the past two years.He met with us on a monthly basis and gave us valuable insights into the fundamentals of owning and operating a small family business. We learnt to write a business plan, understand financials, get along as family in business, motivate staff and deal with all aspects of operating a business. He was very understanding and worked with us at a pace we could cope with. He took time to understand us and how we worked in our current environment. He offered advice and encouraged us to try different approaches. He is a very skilful person with an amazing business skill set which set us on the pathway to operating a successful business. He would be a valuable asset to anyone who wants honest direction and willing to listen to advice. He has been inspiration and a life saver. Greg Bartlett worked with me when I was a Practice Manager at Pet Doctors. Greg helped me work through various issues that came up in the day to day running of a veterinary practice. Greg is an inspirational person, who gives advice that is both meaningful and useful, while keeping the business needs in mind. Greg is a very astute person who recognises people’s strengths and areas for improvement. One of Greg’s most valuable strengths is his vet coaching. He understands the problems that vets face in their daily tasks, he empathises with them, and then helps them to see where they could improve or resolve an issue they may be facing. I would recommend Greg as an asset to any business and would value his input at any time. As a non-veterinarian Business Manager of multiple clinics going through major change, Greg’s help and support was invaluable. One of his greatest strengths is he works WITH the team to help everyone find the way forward. As a sounding board and for clinical support his support was unstinting. His practical coaching, particularly of junior staff was very well received. Greg has worked across the Pet Doctors group of clinics since 2010. In that time he has demonstrated an ability to lead Veterinary teams, both as a mentor to individuals and to groups on a project and change management basis. Greg has consistently sought to develop his own skills as a coach and mentor, and can legitimately claim a position in the select group of Vets in NZ that work in the field of clinical, personal resilience and business mentorship and coaching. I've worked with Greg for approximately two years in my role as Practice Manager at Pet Doctors. I've always found Greg to be approachable and easy to talk to. Most recently his role with me was coaching and mentoring me and my Veterinarians across the four clinics I am responsible for. As I vet nurse, I respect the fact that Greg 'gets it' from a clinical perspective. He not only knows first-hand many of the barriers and challenges of life as a veterinarian and in vet clinics, he's able to provide direction, support and guidance of how to get over, around and through those challenges. Having worked with Greg in coaching and growing many vets, I am impressed by his practical professional approach, and fresh thinking tailored for the individuals. He quickly makes them feel at ease, and knows when to push forward or stand back in different situations. Greg is organised and keeps me on track with planned support/coaching meetings, which is very much appreciated in the crazy world of the clinics. Greg is always at the end of the phone, skype or email with great advice, positive support and practical tips on getting the best from me and my team. I'd confidently work with Greg in the future, and recommend his skills. Two years ago I took on a management role as a senior veterinarian in private practice. This meant I had to learn a new leadership skill set to cope with the added responsibilities, continue to develop my clinical skill set, and manoeuvre through many challenging decisions. Greg through all circumstances has been the most supportive mentor I have encountered in my career as a veterinarian. His perceptive vision, practical and sound guidance, as well as empathetic advice have been invaluable in the development of my career and also personally. Greg’s diverse knowledge of the industry and the unique stresses that veterinary professionals endure daily gives him formidable insight on how to develop strategies for individuals to cope and manage situations in a positive and constructive manner. There is a great quote that says "the best teachers are those who show you where to look, but not what to see" (Alexandra Trenfor). I truly believe that Greg embodies these valuable qualities and am pleased to continue working with him towards a brighter future. I would recommend his services to any professional wanting to achieve focus in their lives and reach their goals, whatever they may be. Every issue, belief, attitude or assumption is precisely what stands between you and your relationship to another human being – and between you and yourself. Logic will get you from A to B. Imagination will take you everywhere…It’s the preview of life’s coming attractions. Nature, time and patience are three great physicians. When you tell the truth, you never have to worry about a lousy memory. Doing the best at this moment puts us in the best place for the next moment. At 20 we worry about what others think of us; at 40 we don’t care about what others think of us; at 60 we discover they haven’t been thinking about us at all. The only person you’re destined to become is the person you decide to be. Keep your sense of proportion by regularly, preferably daily, visiting the natural world.